I like to keep up with new breweries when they open. Thankfully, with Pacific Brewing they announced their grand opening on Facebook so I was able to check it out on the first day. There was a solid crowd for a new brewery and yet parking wasn’t an issue. Pacific Brewing presented a solid lineup that will serve as a good baseline as they expand into different styles of beers. 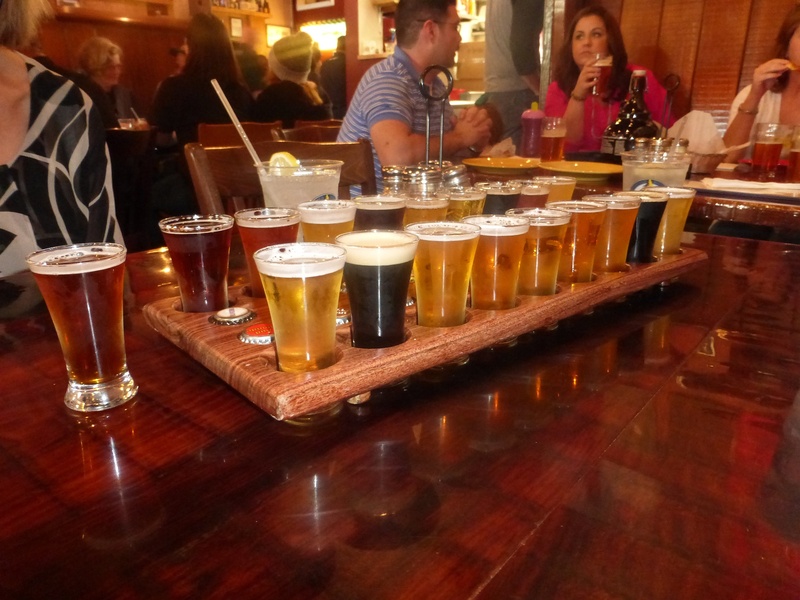 I started with a flight and added an additional taster so that I could taste all of the beers in one go. They offer a blonde, pale ale, IPA, strong ale, and rye double IPA. The blonde was a solid version of the classic style without much variation. It is up there with some of the best San Diego blondes. The pale ale is more towards the English style and has many similarities to the ESB style. The pale ale presents many caramel flavors on the front with a light hop flavor on the back end. 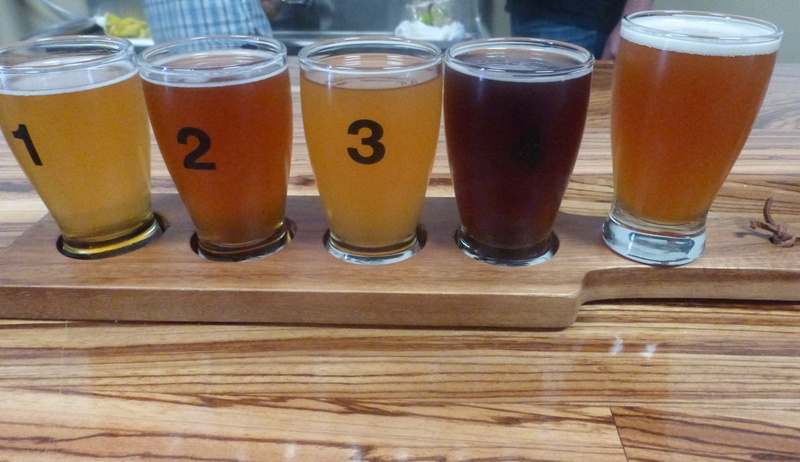 Left to right, Blonde, Pale, IPA, Strong Ale, Rye IPA. The IPA has a powerful citrus nose. The flavors are heavy on citrus and pine, in line with other San Diego IPAs. I would estimate this beer has around 70 IBUs so it is fairly bitter. I really enjoyed the IPA and ended up with a pint after all the tasters. The strong ale is almost 8% and yet is very drinkable. The flavors are primarily in the sweet caramel range such that it might satisfy some who are mostly fans of porters and stouts. The double IPA is a little low on the alcohol compared to some you might see in San Diego but not short on flavor. At 8% it isn’t that much stronger in alcohol than the IPA but the rye gives it a unique flavor. The rye manages to be mellow enough that it doesn’t overpower the hops. Most of the hop flavors are more on the back end and the citrus and tropical fruit flavors mix well with the rye. 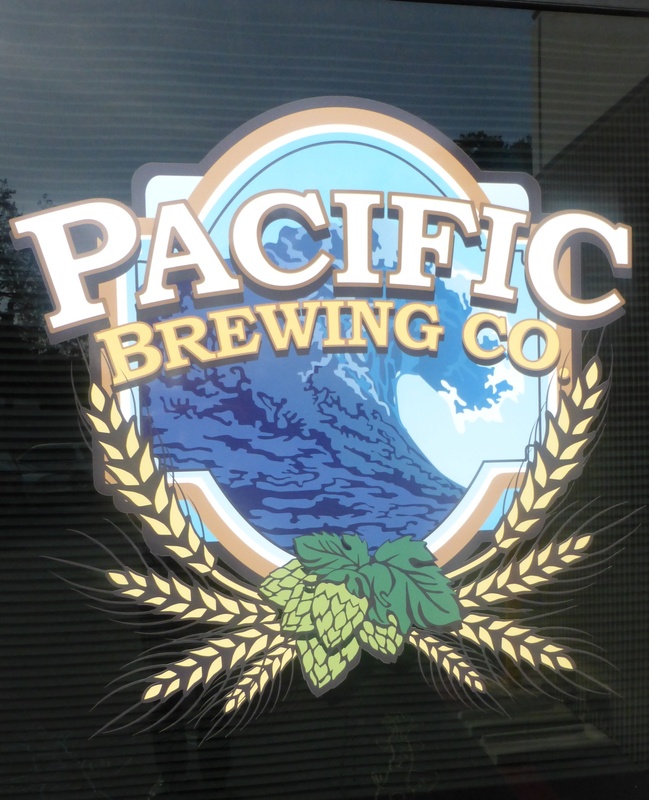 Pacific Brewing has a similar feel to other small breweries inside though the wood used for the bar sets them apart with some distinct colors. Fans of hoppy beers will find a lot to love in the IPA and the Rye Double IPA. Fans of sweeter malt beers will enjoy the pale ale and strong ale. If the strong ale isn’t enough, you can always head next door to 2 Kids for some chocolate stout. 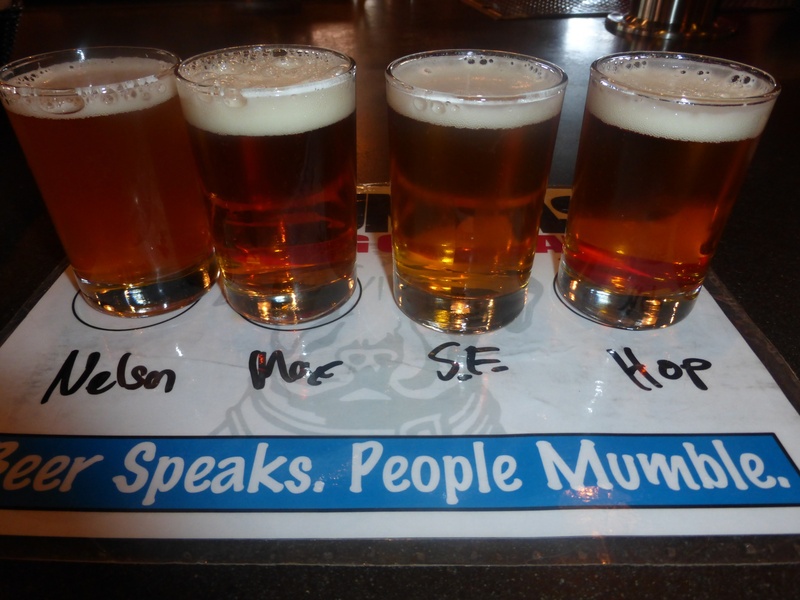 I look forward to trying the different styles of beer that Pacific Brewing comes up with in the future. UPDATE: Pacific Brewing recently released a stout due to the large demand. 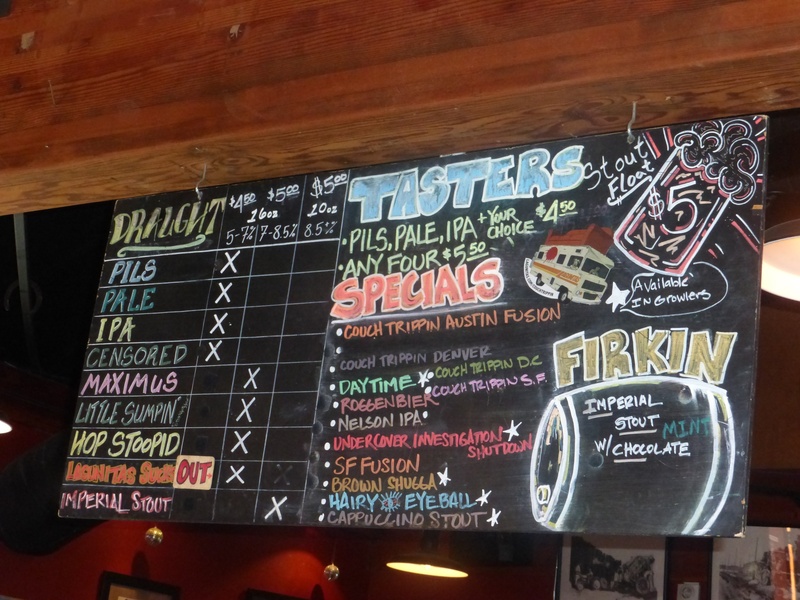 I stopped by on June 1, 2014 to try the “Simmer Down Stout” and thought it was solid. The stout is a dry chocolate stout that isn’t as sweet or as thick as the stout at 2Kids. It should satisfy my husband though I haven’t yet brought him by to try it. To start this series of unpredictable beers we are given Grapefruit Slam. Hop heads should be well familiar with the grapefruit flavors that come from some of the most common hops used in San Diego IPAs. A number of delicious IPAs put grapefruit flavors at the forefront of the hop profile. 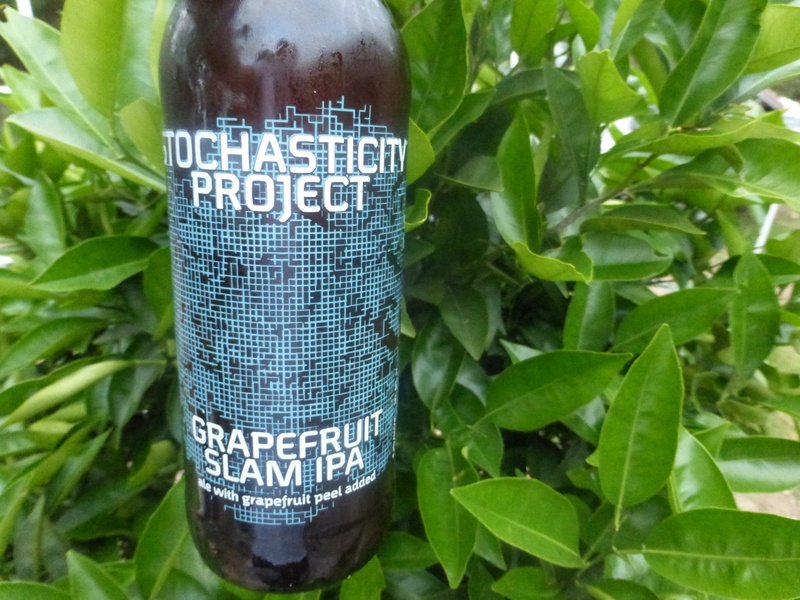 To give a truly knock-down strong grapefruit flavor to this beer, Stone added grapefruit peel to the final beer. This gives it a flavor unlike anything you’ve had before. Grapefruit Slam in front of an orange tree. At 8.2%, this beer was already pretty bitter before any grapefruit was added. The addition of grapefruit gives it a powerful punch and a sneaky aftertaste that will excite most hop-heads. Though I don’t particularly care for fresh grapefruit, thankfully this doesn’t get as insane as some Japanese and Filipino beers that I reviewed earlier. It is still a San Diego Double IPA at heart and should satisfy Stone fans who stumble upon it when searching for the latest version of Enjoy By. I happened to buy a few bottles of this beer when I realized I couldn’t find any Enjoy By 4.20.14. Outside craft beer fanatics, Lagunitas is probably more well-known than Russian River because their beers are widely distributed in Southern California. I decided to not get tasters of some of the more commonly available beers while I was there so that I could try some newer ones. 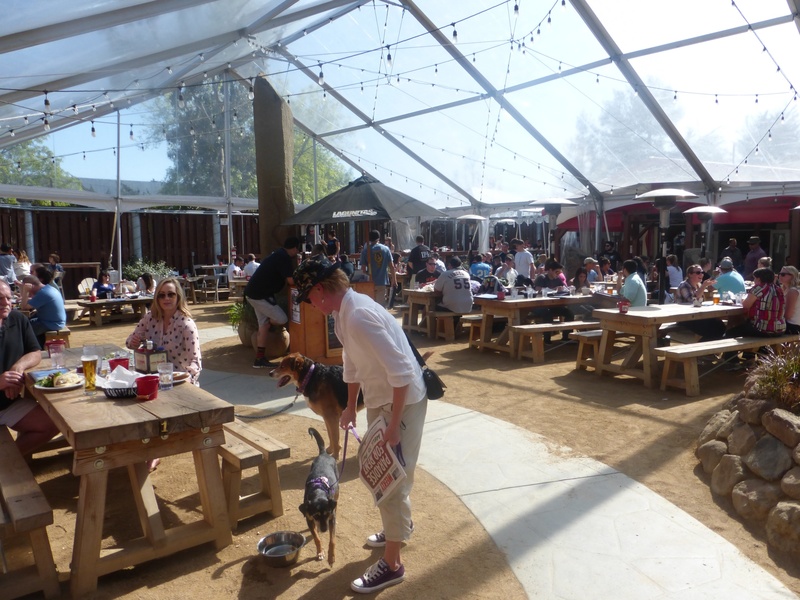 Lagunitas is also a brewpub, meaning it is open earlier in the day, and the crowds can get pretty crazy. Since we got there a little bit later and had already eaten, it wasn’t too crazy to find a spot at the bar. The outside seating area surprised me because it looks like you are visiting a ranch, complete with sandy floor and picnic tables. I ordered a taster flight of Nelson IPA, Maximus Double IPA, SF Beer Week Double IPA, and Hop Stoopid. Of the four, Maximus and Nelson were my favorites. The Nelson IPA has all the grapefruit flavors you might expect from the Nelson hops. Some sweeter flavors recognizable from the regular IPA on the back end round it out nicely. Taster Flight, A knockout punch of hops. The Maximus Double IPA has plenty of tropical fruit flavors on the front end combined with some more earthy hop flavors on the back. The San Francisco Beer Week Double IPA is made with Nelson, Mosaic, and Hop 366. The beer had a slight soapy flavor combined with the citrus flavors from the other hops. Heavy pine flavor comes in the back from the Hop 366. I probably would have enjoyed this one a little more without the Hop 366. I ended it with the Hop Stoopid. It was so strong that it became thick and syrupy. The flavors leaned heavily towards the tropical fruits. I recognize the style here but it isn’t for me. Lagunitas is such a big brewery that you are likely to find most of their core beers all throughout California and many other states. It was nice to finally stop in for a visit but I don’t think I’ll be back. Like Stone, I can get most of the best beers in bottles almost everywhere I look. Best known for its Blind Pig IPA, Pliny the Elder, and Pliny the Younger, I had to stop by the brewery to try some beers. Because I was going to Lagunitas on the way back I only tried a few half pints while I was here and the single hop pales were my favorite. Before I get to the beers, I should note that this is a brewpub, not a pure brewery and tasting room. When you arrive there it is pretty obvious that the zoning wouldn’t permit a barebones brewery. Being a brewpub means you can stop by earlier in the day for a pint because they are open for lunch. However, this also means that it gets crowded pretty fast and seats don’t clear out very quickly. I started with Row 2 Hill 56, a single hop simcoe pale ale and Hop 2 It, a pale ale made exclusively with Hop 366. I love single hop pales because I get to really understand the flavors of individual hops. Simcoe is used pretty commonly in IPAs. The lemon and pine flavors come through nicely in this one. Hop 366 is a new experimental hop related to the warrior hop. It was much more earthy with a hint of tropical fruit on the back. I moved on to Blind Pig IPA, one that has been listed on numerous “Best IPA” lists. It certainly had a nice balance to it but was far too heavy on the pine/earthy flavors for my taste. Though there was some strong grapefruit taste in the background, it was still pretty overpowered by the other hops. It is certainly a good IPA but not my favorite hop profile. My favorite hop profile comes through a lot more with Pliny the Elder, a fairly widely distributed double IPA. I’ve had Pliny the Elder a few times on tap in San Diego at various bars. Finding it in bottles is not so easy. 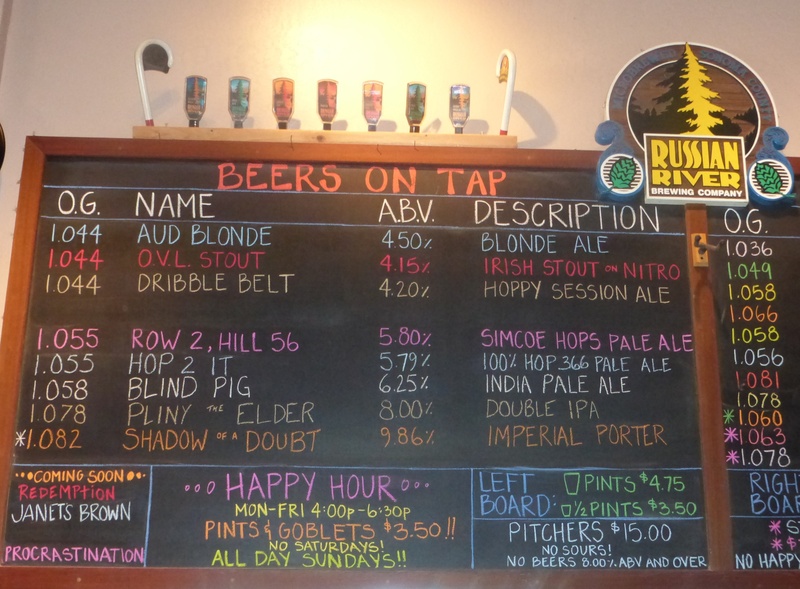 Even at the brewery, they limit the number of bottles you can purchase of both Blind Pig and Pliny the Elder. 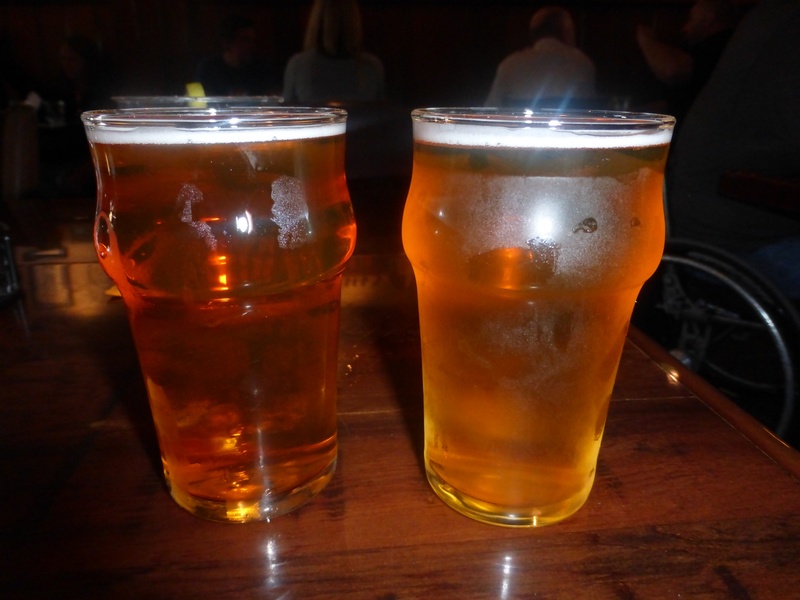 Pliny the Younger has much of the same hop profile as Pliny the Elder but is a Triple IPA. I am a bit disappointed that Russian River decided to make Pliny the Younger a once a year special release because this leads to long lines wherever it appears. Flavor wise, you will get much of the same beer from Stone’s Enjoy By series, Green Flash’s Green Bullet, and Saint Archer’s Double IPA. I waited in line for Pliny the Younger last year and it was delicious but I probably won’t wait in line for it again. In all, I found Russian River to be insanely crowded (very similar to visiting Stone Brewing) and not hugely worth the trip. It is a shame that they don’t widely distribute bottles of their famous beers because there is enough demand from the craft beer drinkers around the country for it. I’ve been saying for a while that we need a good Session IPA in six packs. Stone Go To IPA hits all the right notes and was released just as the Session IPA demand has gotten fairly large. I’ve been hooked on Modern Times Fortunate Islands because it was available in four packs of 16oz cans. Then Lagunitas recently released their Session IPA. Unlike a few other Session IPA beers, Stone Go to IPA is not a good introduction for the IPA hater. Through a technique they call hop-bursting, which sounds like double-dry-hopping on steroids, they cram as much hop flavor into the beer as they possibly can. In true Stone fashion, this is not a beer for everyone. It is more heavy on the citrus hops than the Lagunitas variety, which makes it more my style. Still there is something refreshing about the Fortunate Islands because it only uses a few varieties of hops. I haven’t yet compared it side by side with the Fortunate Islands but I can see myself returning to this much more than the ordinary Stone IPA or Pale Ale, both of which I consider to be a bit too malty for my tastes. If you haven’t yet gotten over the insanely strong double IPAs you will consider this a sissy 4.5% that should be reserved for the weak. It will be here when you get that craving for IPA at 1PM on a Sunday and don’t want to be weighed down by a 7% IPA.